I have a Microsoft SQL Server 2005 DB server. In the DB server, I have around 250 user databases. I have to take a back up of all these databases. Since, manually taking backup consumes lot of time, I am looking for a Batch script or DB script which will automatically take the backup of all the 250 databases. Can anyone please help on this? Step 1: Create a procedure that are given below. Step 2: Execute the above procedure. You can also schedule this procedure. This procedure is tested hopefully it will help. 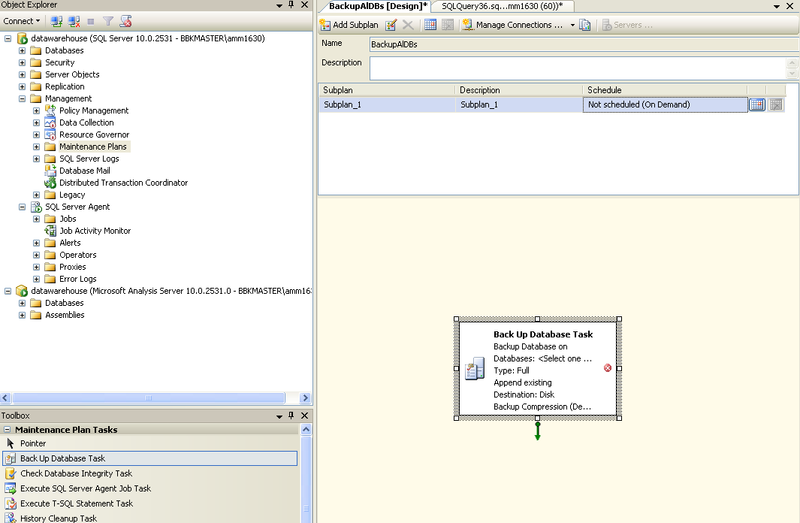 Configure the Task, select Databases, Folder location, Type of Backup (Full, differential, Transaction log) connection etc. I know for a fact that maintaining a lot of databases with SSMS could be a little confusing, but it's straight forward. I can recommend a more effective way, that is using Ola Hallengren's maintenance script. It is very cool and very effective. 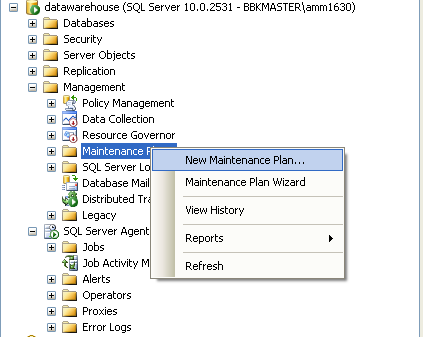 And you can do much more than just backing up all databases, you can do all types of maintenance procedures. 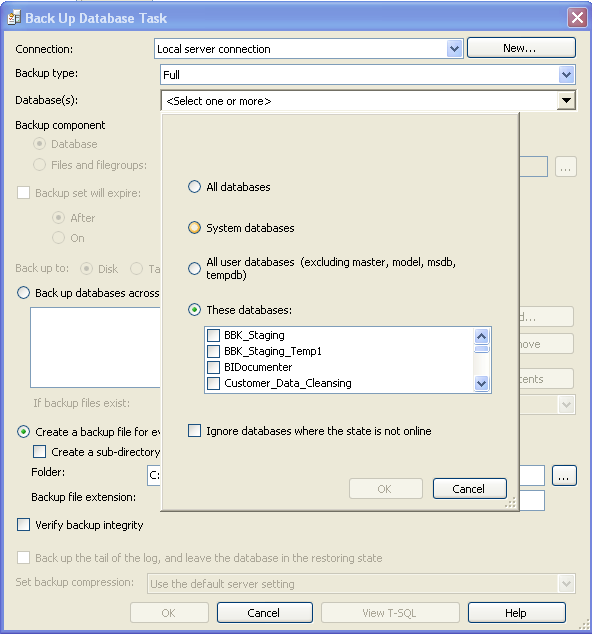 $dbbk.BackupSetName = $dbname + " Backup"
$dbtrn.BackupSetName = $dbname + " Backup"
How to take SQL Server database under this scenario? 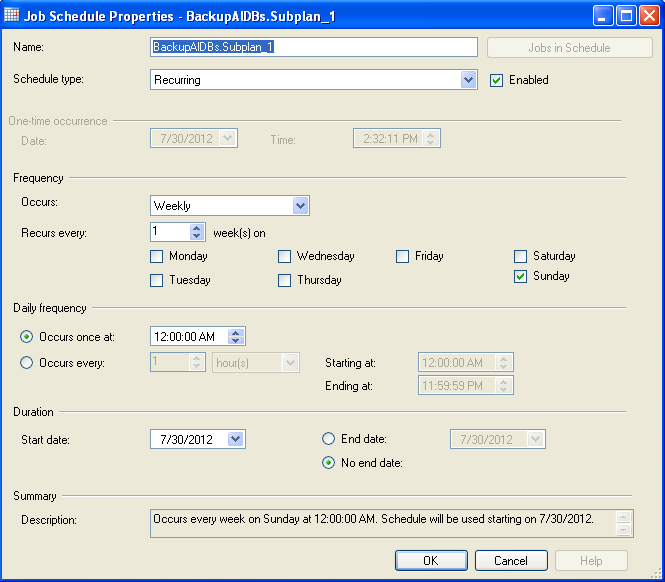 Can SQL Server start taking backups by itself?